1. Voters overwhelmingly want to see immigration reduced – a view shared amongst previous migrants and BME (Black and Minority Ethnic) voters as well. Policies to reduce immigration are therefore not likely in themselves to deter BME voters from voting for any party, including the Conservatives, as has been suggested by a new lobby group Bright Blue. It is however essential that politicians are sensitive to the views of migrant and BME communities who are more likely to view previous immigration as positive, but share concerns over its present scale. The debate about reducing immigration must therefore be respectful of the contribution made by previous waves of migrants to the UK and be conducted in the right tone. 3. Both of these claims are false. This rebuttal will show that the Bright Blue polling questions were heavily biased and that the results do not support the report’s claims. Furthermore, polling conducted elsewhere provides extensive evidence both for concern among Conservatives about the scale of current immigration and for considerable support for this view amongst migrants and BME communities. This paper will also examine the funding of this new organisation. 5. The authors deduced from this that “Although Conservatives believe that lowering the number of migrants is important, it seems to be a less important public policy aim than ensuring the UK gets immigrants who will contribute”. It is hard to see much connection between this conclusion and the question actually asked. Furthermore, it is surely obvious that “well managed” would be seen by responders as including a sensible scale of inflows. 6. This is borne out by previous polling which shows that Conservatives have a considerable commitment to reducing numbers. 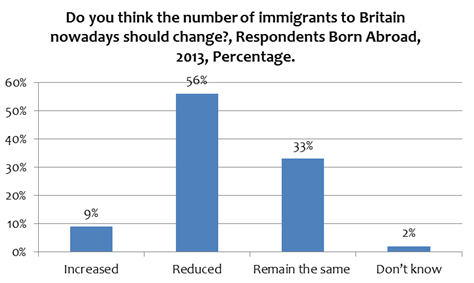 In a January 2014 poll respondents were asked whether they “support or oppose” David Cameron’s aim to reduce net immigration in Britain from hundreds of thousands to “tens of thousands”. Overall, 78% of the general public supported this aim and, amongst those that intended to vote Conservative, support rose to 88%. 7. The Bright Blue report claims that Conservative policy on immigration would be “more in tune with its supporters if it determined who should be let into the country based on the merit of individual cases rather than indiscriminately reducing overall numbers”. They go on to provide nine examples of people who might wish to come to the UK and ask respondents to say whether they should be allowed to immigrate. 8. No information is given about the current immigration arrangements for these nine examples. In fact, there is no current limit applying to five of their cases. In three others conditions apply. Only one case (an unemployed Kenyan national with no savings) is effectively ruled out under present regulations. Box 1 below gives the Bright Blue examples. We have added in italics the true position in each case. ‘Someone who is a highly qualified software engineer wanting to work in the UK, but who has no savings and does not have a specific job lined up in the UK in advance’ – This individual would not be allowed to come to the UK until they found a graduate level job that could not be filled by a worker in the UK or EU and which paid a minimum of £20,500. ‘Someone who has no job, but has several million pounds in savings and wants to buy property in the UK and shares in UK companies’ – There is no limit on the number of overseas investors that can come to the UK under the Tier 1 (Investor) route. ‘A pensioner from another EU country who has a moderate pension and wants to buy a house and retire in the UK’ – There is no restrictions on the movement of self-sufficient EEA citizens. ‘A temporary migrant worker from Eastern Europe who comes each summer to work on a farm in the UK picking fruit’ - There is no restrictions on EEA citizens coming to the UK to work. ‘A qualified care worker who has been offered a job working in a care home for the elderly in the UK’ – A qualified care worker could come to the UK if the role was a graduate level one which earned £20,500 per year and if the job could not be filled by a UK or EEA born worker. Tier 2 (General) is capped at 20,700. ‘A man from Kenya with no job and no savings who is looking for a better life for themselves’ – This individual would have to find a job under Tier 2 in order to come to the UK for work. ‘A South Korean woman who is married to a British man and has two children with him, where he works full time on the minimum wage’ - This person would not be able to come to the UK on the grounds that the taxpayer would have to support this family. The sponsor would have to earn a minimum of £18,600 (or in savings) in order to be granted a visa. ‘A Chinese student who wants to pay to come and study for 3 years at a UK university’ – There is no limit on the number of genuine students that can come to the UK for study. 9. The polling goes on to test respondents’ attitudes to different categories of migrants, such as international students, asylum seekers, skilled manual workers etc., and suggests that Conservatives do not wish to see their entry to the UK refused. However, yet again, no information has been supplied to the respondents about the scale of each group’s entry into the country. 11. Their polling also finds that Conservatives are largely split on whether immigration has enriched British culture (29% agree, 41% disagree, and 27% neither agree nor disagree), whether it has helped support the NHS (38% agree and 35% disagree and 23% neither agree nor disagree), and whether it has provided skills for our economy (42% agree, 26% disagree and 29% neither agree nor disagree). Most do, however, agree (69%) that it has increased the range of food available. 12. It is quite clear from this poll that Conservatives are concerned about the scale of immigration to the UK and they understand that the present scale of immigration has serious downsides. It is extraordinary that Bright Blue should claim the opposite. 13. At the beginning of this Parliament the Prime Minister made a promise to the electorate to bring net migration down to the tens of thousands in response to overwhelming public concern about the scale of immigration to the UK. The question that now requires answering is whether there is a marked difference between the opinions of the majority white population and those from the BME communities on the specific issue of whether immigration should be reduced, increased or stay the same. 14. It is not enough to suggest that, because BME respondents are more positive about the contribution to the UK made by immigration, they are therefore less in favour of firm control over immigration. It is perfectly possible to agree that migrants have made a significant contribution while also wishing to see immigration reduced from its current very high level. It is perhaps inevitable that a greater proportion of BME respondents will believe that immigration has had a positive impact on Britain in terms of its economic and cultural contribution, as some will either be migrants themselves or have parents and grandparents who were migrants to Britain. This does not preclude them from believing that immigration is too high. 16. Despite this, Bright Blue claim that a certain demographic makes you more likely to be ‘welcoming’ and ‘positive’ about migrants. Those characteristics include being younger and richer as well as being non-white and ‘knowing immigrants well’ and to a certain extent being London based and an “economic conservative”. Characteristics they associate with being less positive and welcoming are being older (55+), being characterised as in the lowest social group DE, being white, being a “social conservative” as well as not knowing immigrants well. 17. These two groups are consistently pitted against one another and it is clear throughout the report that the former group is considered the future and the latter the past. The latter are regarded as necessary to win the election in 2015 however Bright Blue claim that ‘in the long-term, the Conservative Party has to choose a stance on immigration that either aligns with the views of its older and white supporters, who don’t know immigrants well, or fits with its younger and more ethnically diverse supporters, who know immigrants well. Undoubtedly, because of demographic changes, this latter group is going to represent a bigger part of the Conservative support base in the future.’ Nowhere do the authors contemplate the possibility that attitudes might change over time. 18. What is most significant is that the report ignores a considerable body of polling evidence which finds that migrants do not differ greatly from the wider public in their attitudes towards immigration. In fact, this is to be expected because migrants are far more likely to be impacted by waves of new migration since many are often in competition for jobs and housing. This is borne out by the Bright Blue polling results. 19. The Bright Blue poll found that non-white respondents were far more likely to report that ‘I have lost my job or suffered a loss of income as a result of competition with immigrants’ (13.6% amongst non-white respondents compared to 7.7% of the general population) and that they ‘have been denied access to housing or other public services because priority seems to have been given to immigrants’ (20.6% of the non-white population compared to 10.8% of general population). There have been similar findings elsewhere; a Searchlight poll in February 2011 found that 40% of the Asian community polled believe that immigrants had put their jobs at risk and 47% believed that immigrants had made it harder to get a fair wage for what they did. 20. It is difficult to tell from the Bright Blue report what the attitudes of migrants to immigration policy really are because the questions are so heavily skewed that the results are virtually meaningless. That said, Bright Blue go on to present a false choice to the Conservative Party, claiming that they will have to adapt immigration policy to changing demographics, despite presenting no evidence that there is a substantial difference in views. 21. The British Social Attitudes Survey, a long running survey of 3,000 British residents, found that in 2013 79% of respondents thought that the number of immigrants to the UK should be reduced, 59% by a lot. 22. As Figure 1 below shows, breaking down these results by ethnicity shows that while white respondents are overwhelmingly in favour of a reduction in immigration, the majority of respondents of all other ethnicities as are also in favour of immigration reductions with 60% of Asian respondents wishing to see immigration reduced (38% by a lot), 57% of black respondents wanting immigration reduced (32% by a lot), 60% of mixed origin respondents wanting a reduction (30% by a lot) and 56% of ‘other’ ethnicities believing that immigration should be reduced, 32% by a lot. Figure 1. British Social Attitudes Survey, 2013. 23. As well as BME respondents believing that immigration should be reduced, the majority of those born abroad of all ethnicities also believe that immigration should be reduced. Figure 2. British Social Attitudes Survey, 2013. 25. Indeed polling elsewhere confirms that on immigration policy migrants and those from BME backgrounds are not too different from the general public. The Migration Observatory found that the majority of non-UK born individuals and non-white individuals wanted to see immigration reduced and almost one third of these wanted it reduced by a lot. A Searchlight poll in 2011 found that almost one third of Asian respondents were in favour of either stopping all immigration altogether or stopping all immigration until the economy improved. 26. BME voters do however show a much greater propensity to vote Labour than Conservative. The Runnymede Trust 2010 election study found that amongst all BME voters 68% voted Labour compared to just 16% Conservative. This propensity is even stronger amongst the Caribbean community, 78% who voted Labour (9% Conservative) and the African community, 87% of whom voted Labour (6% Conservative). There is a greater propensity to vote Conservative amongst Indian voters (24% voted Conservative) and Bangladeshi voters (18% voted Conservative) compared to all BME voters in general. For those who might be inclined to consider voting Conservative it is highly unlikely that they will be much affected by a policy that is broadly supported by many in their own communities. Of course the Conservatives should continue to try to attract BME voters, however, relaxing immigration control is not the way to do this. 27. That said, BME respondents are far more likely to think that immigration has been a good thing for Britain in terms of its economic and cultural contribution to British life. This suggests that the tone of the debate and the way in which politicians articulate the rationale for reducing immigration is extremely important if they are to avoid alienating potential voters who approve of policies to reduce immigration. 28. Bright Blue is a relatively new ‘think tank and pressure group for liberal conservatism’. The report analysed in this paper was funded by the Barrow Cadbury Trust, a well-known grant making organisation that has supported the many organisations that support present levels of net migration, including British Future, the Institute for Public Policy Research, the Migrants Rights’ Network, and the Migration Observatory. Indeed the Barrow Cadbury Trust were one of the organisations that coordinated efforts to change public opinion on immigration under the ‘Changing Minds’ project. 29. Bright Blue has a dedicated ‘Immigration Project’ on its website. It is there that a petition exists calling on the government to remove students from the net migration target. The petition is supported by the British Chambers of Commerce, the Institute of Directors, the National Union of Students, Universities UK, Universities Alliance, Guild Higher Education, Million +, and the Association of Business Schools, all of whom (with the exception of the NUS) are likely to benefit financially or represent organisations that are likely to benefit financially from increasing numbers of overseas students. 30. Bright Blue therefore seems to be the product of a partnership between the financial interests of big business and the ideological approach of the Left. Both support large flows of migrants but for very different reasons. 31. It is clear that while respondents from a BME background view immigration in a more favourable light in terms of its economic and social contribution to the UK, the majority still believe that immigration to the UK should be reduced. BME voters are therefore unlikely to be put off by political parties’ policies that seek to reduce immigration, so long as the tone of the debate is conducted in a respectful and sensitive manner, focussed on the actual issue of concern which is the current scale of immigration. Bright Blue, which seeks to undermine Conservative policy on immigration by suggesting that it could be electorally damaging to pursue a policy based on reductions, are in fact funded by the very grant making organisations that are behind the rest of the immigration lobby as well as by big business and the education sector who have their own financial interests. Their claims should be seen in this context. 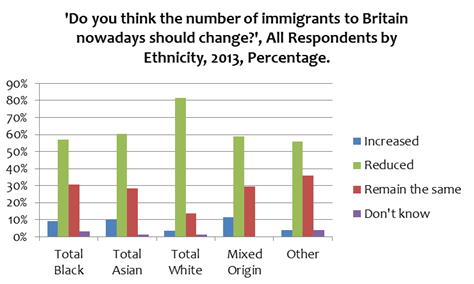 Bright Blue, ‘A Balanced Centre Right Agenda on Immigration: Understanding how Conservative Voters think about Immigration’, January 2015, URL: http://brightblue.org.uk/immigration.pdf. Data tables can be found here: http://survation.com/archive/2015-2/ see 19th January 2015. Runnymede Trust, ‘Ethnic Minority British Election Study – Key Findings’, February 2012, page 6. Runnymede Trust, ‘Ethnic Minority British Election Study – Key Findings’, February 2012, Table 1, page 3.